Ankole are of the Sanga type, often the coloration is red but fawn, black or pied are not uncommon. 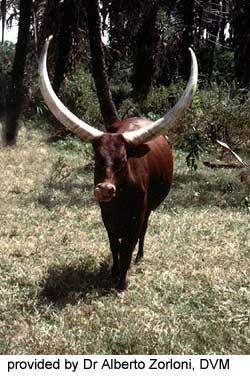 This breed was used in the development of the Ankole-Watusi in the United States. 1. Bahema strain: found in Northern Kivu, near Edward and Amin Lakes. 2. Bashi strain: found in Southern Kivu, around Lake Kivu. 3. Tutsi strain: found in Burundi, near the northern part of Tanganika Lake. The Kigezi strain reported by Mason (1995) is less common. The size of horns are smaller in the Bahema and the largest horns are found in the Tutsi strain. 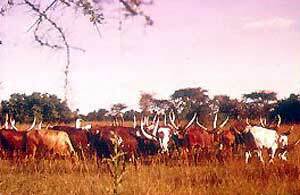 The color of the Ankole varies but the Tutsi strain is predominately red.